Comfortable, light weight, lower cost lodging for your car or truck. 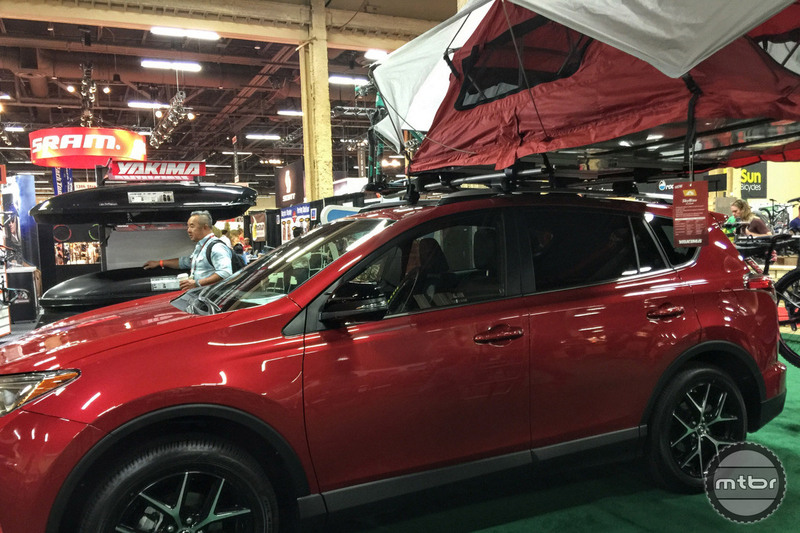 Rather than a massive SUV, Yakima used a mid-size Toyota Rav4 as the demo vehicle to show Mtbr why it believes a smaller, “expandable” vehicle is the optimum way to handle life’s adventures. 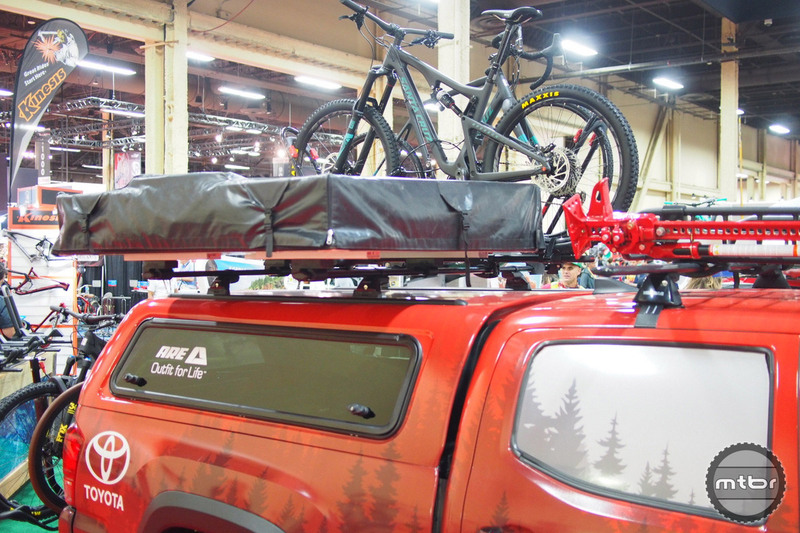 Rooftop tents have captured the attention of mountain bikers. They allow adventurers access to far away trails, and establish a base of riding operations quickly. Securely attached to a rack that is positioned on the roof of a truck or car, these tents are space and time efficient. Set up is quick. Basically just unfold, lower the ladder, and climb in. You’ll also be sleeping off the cold, rough ground, with less dirt, bugs, and whatever else climbing into your tent. 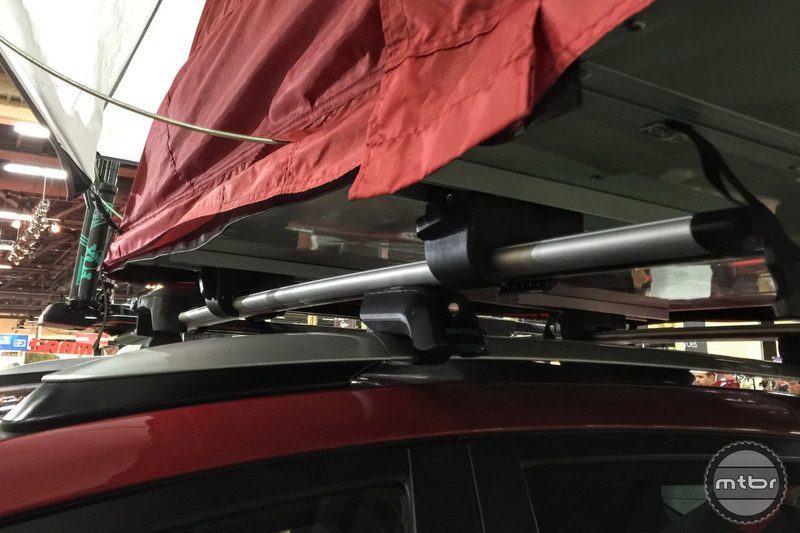 You’ll also likely get a better view of your surroundings thanks to the top-of-car perch. Imagine the panoramic views that await. Even a Las Vegas convention hall looks good from up here. The fact that Yakima has entered this category, validates its growth and relevance to a wider audience. But instead of just copying what others have done, the company took some risks by putting their own spin on the product. They chose to go lighter and more affordable, with two systems that retain the camping tent look. They also utilized their knowledge of roof systems with better integration and locking. Other notable features include a rugged 210d nylon tent body that is certified fire-resistant and breathable, a mesh panel that improves ventilation and your views, and a waterproof rain-fly with PU coating supported by spring steel poles. There’s also a 2.5” high-density mattress with waterproof bottom that provides space-efficient comfort. Tool-free installation with and SKS (Single Key System) lock core integration are designed in as well. The SkyRise is displayed here in folded up form. It can be left on the roof or taken down, with the 2-person tent weighing a claimed 95 pounds. Secure, tool-free installation is a key integration feature of the SkyRise.